- Hayward is doing a lot of calf strengthening at this point, utilizing single-leg calf raises. He said a few months ago, he couldn't do any. Now he's up to 20, doing them in rhythm with a metronome to challenge himself. - Interestingly, Hayward says his shot feels better -- quicker and more compact -- and he thinks his range has expanded. If that's the case, he could be even more effective for the Celtics next season. As Houston has proven extensively this season, being able to reliably shoot a couple of feet behind the 3-point line can make a big difference for your spacing. When Gordon states that his shot is quicker and more compact, I don't know if getting his shot off quicker means he lets it go on the way up like Steph Curry, but it is a good sign. Not sure what he means by "more compact", but I assume it may refer to lesser arm movement. That makes sense after shooting from a chair and then standing but not jumping. More propulsion is needed from the arms without an assist from the legs. Makes sense. Now when he uses his legs on the shots, he needs less arm movement. AND FINALLY: Hayward outlined all the steps he needs to go through to get back on the court. He's jogging now, and the next step is full-speed workouts on the court. 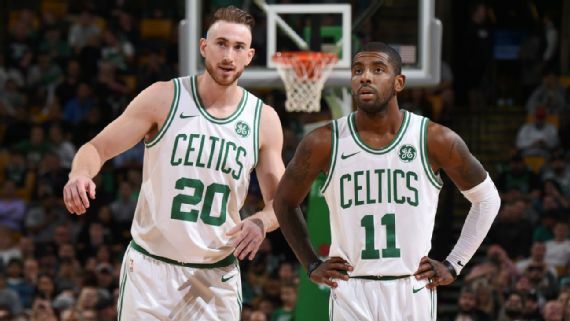 Once he can run forward and jump -- Hayward says the pain he experiences jumping is a reminder that he still needs to take it easy -- he will begin working on his lateral movement. "That's definitely the hardest part," Hayward wrote. "The lateral movement is where you're really testing those ankle ligaments. I'm not there yet." The pain when jumping would be normal. Notice he uses a metronome when doing calf raises in order to control speed of movement. Not so with a jump. It has to be quick. Thus the pain, both from the takeoff and the landing. And the lateral movements will definitely test the muscles, tendons and ligaments that were damaged in the initial injury. So is this solid progress? You bet it is. Great to see this from Gordon and we await further progress reports.